To assist the child in their natural development our programs offer well-maintained, orderly “prepared environments” which invite a child to move and investigate. The child has free choice in the selection and length of tasks, which are structured for independent and successful activity. 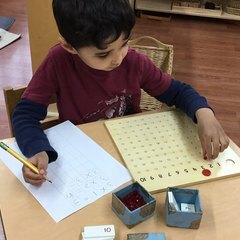 The Montessori materials are designed to isolate a single new concept to be grasped by the child and are self-correcting. They also follow a sequential progression permitting the child to master one task and then proceed to a further challenge. The practical life area is the foundation of the Montessori philosophy. The activities in this area not only assist the child in the development of a long list of practical life skills, but they also help the child lengthen concentration and focus, increase hand-eye coordination, increase socialization skills, gain a sense of personal independence, develop logical thought, be a member of the classroom community, and gain a sense of order. The precise movements of the practical life materials challenge the child to concentrate, work at his/her own pace uninterrupted, and complete a full work-cycle which results in the feelings of satisfaction and self-confidence. Practical life activities are indirectly preparing children for later exercises in reading and writing. The sensory curriculum engages a child’s natural tendency to explore the physical world around him through the involvement of senses. The sensorial materials are hands-on activities that allow the child to understand concepts in concrete ways. These materials help children notice differences, make observations, compare concrete objects, and to understand abstract ideas. 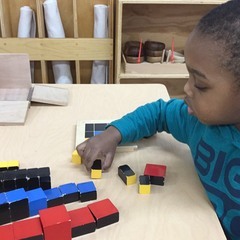 Through sensorial experiences, the child has observed and worked with the distinctions of distance, dimension, gradation, similarity, and sequence which lay the foundation for mathematical thinking. 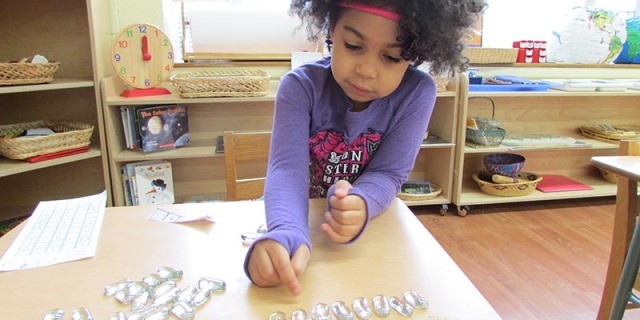 The child’s introduction to mathematics begins with concrete manipulatives that allow for hands-on exploration of a concept. The goals of the math curriculum begin with an understanding of quantity and symbol and then progress to place value and experiences with the operations of addition, subtraction, multiplication, and division. This leads the child to abstract mathematical ideas and relationships. The language curriculum supports a child’s spoken, written, and reading development. Our classrooms provide an immersion for the child in language development and offer many opportunities for the development of oral and written communication skills. 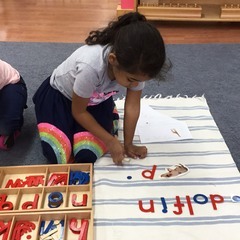 Muscular movement and fine motor activities are developed to aid with the preparation of writing. The child works on activities that help them distinguish the sounds which make up our language. 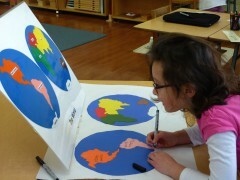 The goal of geography is to bring an awareness to the child of the physical features of the earth, as well as other cultures around the world. The goals of science are to offer concrete exploration of the physical and life sciences to further classify the child’s understanding of the world. We believe children at this age level are developing skills critical to healthy brain development, eye-hand coordination, motor planning, memory, and understanding of non-verbal cues. All of these skills are mastered best through real and concrete learning experiences. Furthermore, the young child learns best when all senses are engaged in learning and real learning experiences are occurring. For all of these reasons, we provide children with a screen-free learning environment. Our outdoor environment is just as important as our indoor environment. We believe learning and developing occurs in the outdoors. 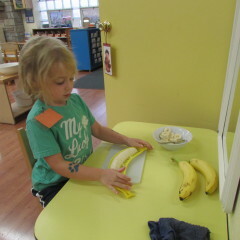 Children develop skills in independence, friendship building, problem solving, and collaborative learning. Children build a meaningful connection with the natural world and have hands-on experiences through outside learning.